The Upper School kicked off the school year by beginning with the end. The end, that is, of the Talmud which was completed at a festive breakfast after davening by Rabbi Gersten. While the 100 7th-12th grader who packed into our lunchroom didn't create quite the same scene as the 90,000 who packed into MetLife Stadium earlier this month for the official siyyum ha-shas, our breakfast did start with video clips from that event so as to help our students feel connected to that historic event from just a few weeks ago. After the videos, the students heard from Mr. Hirsch Serman, who was one of the tens of thousands who learned one page of gemara a day for 7 years as part of the daf yomi program, thereby completing the entire Talmud this summer. 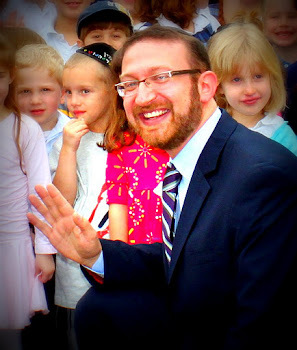 The featured speaker for the event, though, was Rabbi Gersten and he didn't disappoint. Between his powerful exhortation to make talmud Torah a central part of our lives, to his moving tribute to Mr. Matty Osdoba, z"l, it wasn't a speech anyone will soon forget. The speeches were followed by dancing in the gym after which the school year officially got under way. What a way to start. Below are some clips from the speeches as well as pictures from the siyyum and the rest of the first day.